Among the "29 Who Shine" are, clockwise from top left, Brittany Florence Cormier (Ashburnham, Framingham State University), Breanna Lyn Hadley (Chelmsford, Fitchburg State University), Faith Kurtz (Holden, Mount Wachusett Community College), Kimberly Ann May (Leominster, Quinsigamond Community College), Nicholas Scott Merry (Milton, UMass Medical School), and Andrew Huy D. Ngo (Worcester, Worcester State University). Twelve members of the class of 2017 and one member of the class of 2016 have been awarded Fulbright grants to teach and conduct research around the world during the 2017-18 academic year. Since 2005, Holy Cross students have received 92 Fulbrights, placing the college consistently among the nation’s top producers of Fulbright scholars at the undergraduate level. This year’s recipients are headed to Spain, the Philippines, Morocco, Taiwan, Ireland, Mexico, Thailand, Malaysia, Greece, Nepal and South Africa. The Fulbright Program, sponsored by the U.S. State Department and established in 1946, is widely recognized as the most prestigious international exchange program in the world. The highly competitive grants are awarded on the basis of academic merit and professional promise. Six students in Central Mass. are among the “29 Who Shine” in the commonwealth’s public higher education system. 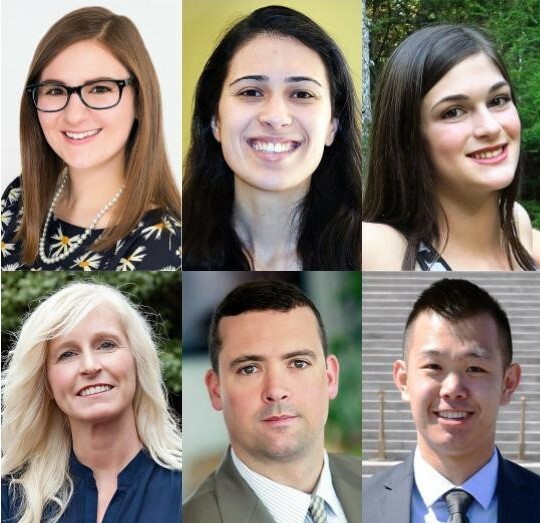 Each Massachusetts community college, state university and UMass campus picks one student annually to receive the award, based on his or her outstanding civic contribution. Gov. Charlie Baker and Massachusetts higher education officials honored the students at a State House ceremony last Friday. Andrew Huy D. Ngo of Worcester was named the representative from Worcester State University. Kimberly Ann May of Leominster was chosen to be the representative from Quinsigamond Community College. Faith Kurtz of Holden is the representative from Mount Wachusett Community College. Fitchburg State University selected Breanna Lyn Hadley of Chelmsford. UMass Medical School’s choice was Nicholas Scott Merry of Milton, and Ashburnham’s Brittany Florence Cormier represents Framingham State University. Holy Name Central Catholic Junior/Senior High School announce the receipt of a $50,000 gift from alumna Naja Pham Lockwood (class of 1986) and her husband, David Lockwood. The gift is a contribution towards the development of a Life Sciences/Biotech Learning Center at the school. Holy Name and the Pham Lockwood family are committed to the construction of a state-of-the-art lab space that will provide faculty and students the best, most current technologies and equipment used in the fields of life sciences and biotechnology. The school is being guided through this effort by WPI, a school partner that has also worked with Holy Name on its wind turbine installation, the creation of a makerspace at the school, and a power storage research study scheduled to begin in the fall of 2017. This new learning space, to be called the Joseph Tham D. Pham Science Center, will include equipment such as autoclaves, centrifuges, a gel electrophoresis system, incubators, and thermocyclers. The total cost of this project, which will be supported by donations from partners, alumni, and friends of the school, will exceed $175,000. The St. Peter-Marian athletic department has hired Frank Ferreer to be the varsity girls’ basketball coach, Director of Athletics Keith Brouillard recently announced. Ferreer served the past 14 seasons at Assabet Valley. He guided the Aztecs to 12 tournament appearances, five league titles and two state vocational titles while earning MIAA Coach of the Year honors in 2015. Music Worcester Inc. recently announced the full results of last week’s Young Artist Competitions. There was a three-way tie for first place in the Senior Division Instrumental division: Pianists Sophie Chen of Shrewsbury High and Lazi Danga of the Bancroft School, a Worcester resident, shared top honors with cellist Kaede Ishidate of Wachusett Regional, who lives in Holden. Andrew Kim of Grafton, a Millbury Street Elementary student who plays the cello, took first place in the Junior Division Instrumental Division. Melody Qiao of Natick won the Vocal Division. The 60th annual Worcester Public Schools Arts Festival is underway. A Seeger Sing kicked off the festival on Friday at City Hall. A festival opening and senior awards ceremony followed at the Worcester Public Library. It coincided with the opening of an art exhibit at the library that runs through May 30. Nine more events are scheduled throughout the month, culminating in the Sullivan Middle School Memorial Day Program on Friday, May 26.